How much is the ride in a tricycle in your area? Here in Marikina City, we pay PhP16.00 minimum for a one-kilometer ride from a tricycle terminal to any place in their designated route. As soon as you come aboard a tricycle on queue in a terminal, the driver will immediately start your ride without asking if you want a special trip or not. They will not wait for another passenger to the place where you need to go. It will be a special trip whether you like it or not and you have to pay the PhP16.00 minimum charge. For the uninitiated, tricycle is a mode of public transportation with specified route in a locality and whose registration and operation is regulated by the local government of a town or city. 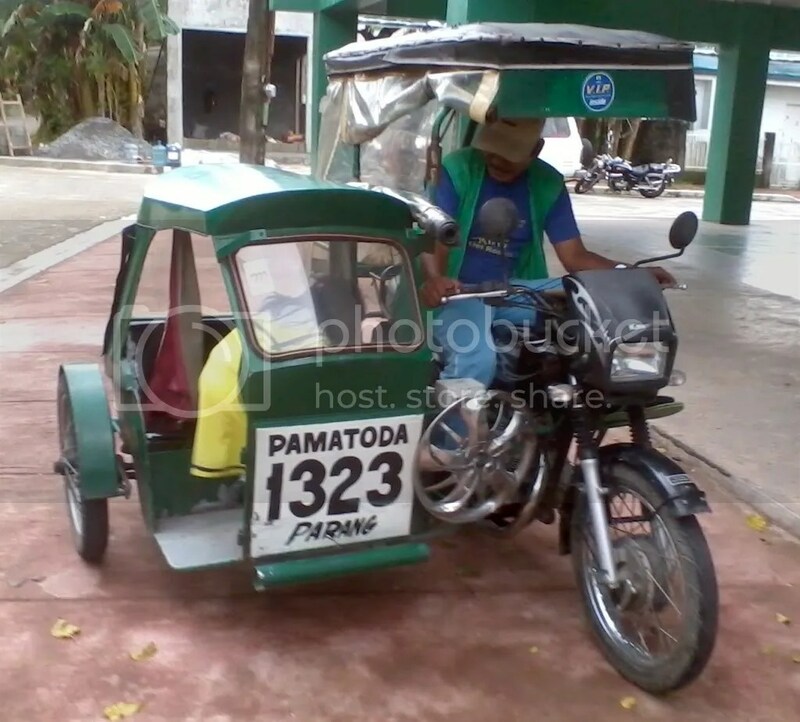 Normal design of tricycles can conveniently convey three (3) passengers including one riding at the back of the driver. Current legal or LGU-approved fare is seven (PhP7.00) pesos for the first kilometer and one (PhP1.00) peso additional for every kilometer thereafter. From the figures above, you could readily see that a tricycle passenger could save PhP9.00 (PhP16.00 – PhP7.00) if he could opt to wait for two (2) more passengers who would go to the same route as his. I should say that many passengers get overcharged against their will because they are not given the option which should be the rule and not the exception. I asked a few tricycle drivers if they know that they are violating the rules in conveying their passengers and I got surprised by their answers. Some drivers say it is always a special trip if a passenger steps aboard his tricycle in a terminal. Others say they are not told by the passenger to wait for the others to come aboard so without being told they go and charge the minimum PhP16.00 for the first kilometer and additional PhP3.00 for every kilometer thereafter. I also asked some passengers if they know that the tricycle drivers are taking advantage of them for not waiting for other passengers to ride with him and was told that they know it but let it go because it has been the practice for sometime. They added that they are not complaining anymore because the authorities won’t act anyway. In these days when money is hard to come by, I really wonder why the local authorities in our city are not doing anything to correct the practice. I, myself, had brought the matter to their attention a few years back and was told that they would act on my complaint but they did not. It’s time to talk to them again and see if they are now threading the straight way (matuwid na landas as PNoy calls it). I fully agree with you that we, commuters, are being taken for a ride, instead of the other way around, by the tricycle drivers. But, the fault really lies with us, commuters, for allowing the tricycle drivers for flouting the rules in their favor. Maybe, some commuters are not familiar with the rules or perhaps our non-confrontational nature tells us not to bother as it may not be worth our time. Nevertheless, lobbying with local government officials to impose the rules as it is promulgated will go nowhere since tricycle drivers will be favored more rather than us, commuters. Reality on the ground is that these tricycle drivers have their associations to back them up while most commuters will not care at all. Simple lang analysis ko dyan noon pa….ang tricycle ay napakalaki ang kinakain sa budget ng isang pamilya. Masakit pa sa katawan ng pasahero pag nagsabay ang isang mataba at payat sa loob ng tricy…sounds funny pero totoo….marami sa design ng tricy ay para sa average na katawan lang. May mga lugar pa sa BATASAN area na 5 hanggang anim ang pasahero …overloaded! Solusyon : Kung ang LRT / MRT ay tulong sa taongbayan upang maibsan ang traffic o mga reklamo sa BUS at ang FX o TAXI ay ganun din sa JEEP….panahon na o matagal na dapat na ipinalit ang JEEP sa TRICYCLE… I – analyse nyo kung gaano kalaking tulong sa mamamayan pag ipinalit or pang suporta ang JEEP sa TRICYCLE. Meron din mga ganyan pangyayari dito sa Marikina.Pero i analyse nyo meron pa din BUS sa EDSA …ganun din FX at JEEP magkasama sa kalye….ang JEEP at TRICY ?…pwede rin siguro d ba ? Nasa gobyerno ang will power wag muna isipin ang mga boto sa halalan…computin nyo gastos ng isang pamilya sa TRICY against kung magkano matitipid sa JEEP…ang laki d ba…mas importante ang isyu na ito pero sana makarating sa kinauukulan para d sayang effort ko sa pag comment ! T.Y. God Bless sa website nyo ! Salamat sa pagbisita at pagkumento mo dito. Katulad rin ng sinasabi ni William (taga-Marikina din siya), kasama rin tayo sa dapat sisihin sa sitwasyon na nangyayari sa pagsakay natin sa tricycle. Hindi natin ipinipilit ang ating karapatan. Sana naman ay maliwanagan ang marami na mali ang mga nangyayari at sumama sila sa atin para maitama ang sitwasyon.